In today’s post, the blogger answers composite questions regarding his July 4 assignment. 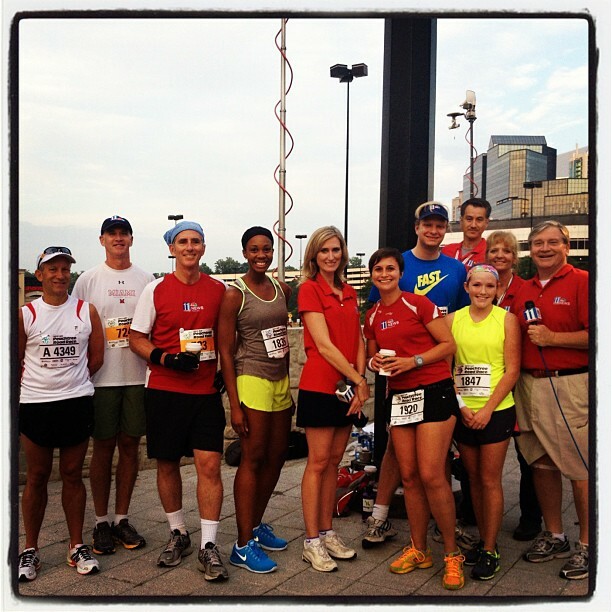 Q: You got paid to run the Peachtree Road Race? A: I did. 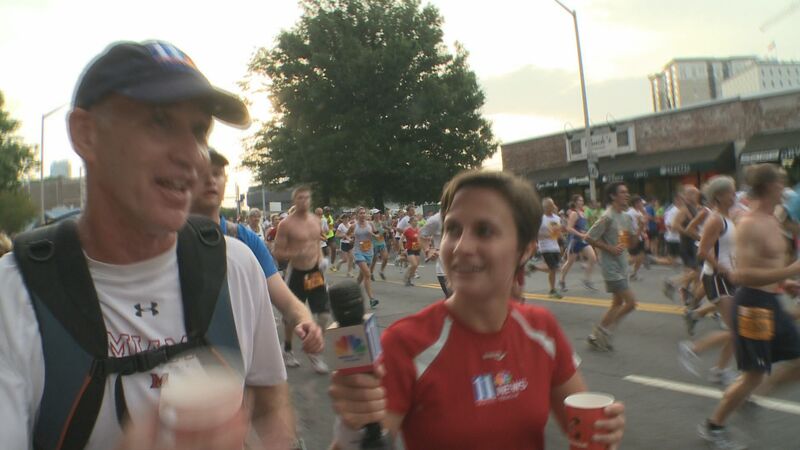 We called it “runner cam.” WXIA did live coverage of the Peachtree. Julie Wolfe, who does ultra marathons and whatnot, was the runner-cam talent. I was there to schlep gear and be a kind-of backstage sidekick. Q: Carried a backpack for 6.2 miles, did ya? A: That was the idea. The Live U unit is a backpack full of gear which amalgamates multiple cell phone signals into a live TV picture. It weighs 25 pounds. I’d trained several times during the previous three weeks by carrying a backpack with barbell weights. But I spent most of the race carrying a seven pound camera instead. Q: So who carried the Live U unit? A: My friend Bo Bancroft. Bo and I have known each other almost 20 years. 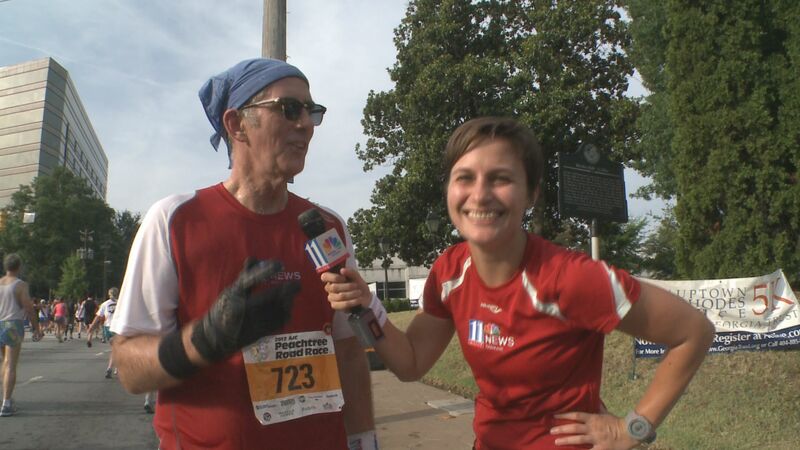 In 2011, I told him about the scheme to schlep a backpack for WXIA’s live coverage of the PTRR. He asked if we needed help. We got him a credential and he toted the backpack for half the race. Incidentally, Bo made a lasting contribution to Atlanta history by making the following suggestion about 15 years ago late one evening: You should rent a Cadillac and get Hosea Williams to give you his tour of Atlanta. The result is embedded below. Q: Why would any civilian volunteer for such punishment? A: Bo requested an 11Alive hat. After he’d carried the backpack five miles, I finally wrested it from him. By then, the batteries had died in the Live U, and Julie was done shooting video for her taped coverage. Julie’s piece is here. Q: Any challenges shooting and running at the same time? John, Bo, Doug, Blayne, Jaye, Julie, Copeland, Matt, Anna, Kathy, Randy. A: Shouldering the camera isn’t really an option. Two hands are required to try to steady the shot and compensate for the naturally-occurring bumpiness caused by running. During interviews, I had to lean forward to look into the viewfinder, which faced sideways in front of me. Thankfully, Julie’s interviews were pretty brief. Even when you’re not shooting, carrying the camera is awkward. It’s attached via coaxial cable to the Live U unit, so Bo and I had to run in tandem. Intern Copeland flanked our rear to dissuade runners from getting between us. Intern Anna ran ahead of us, and shot material with a flipcam, which Julie used in her taped piece. Q: What’s the deal with your attire? A: I’m a sweaty guy. I always run with a bandana. The batting gloves were essential to keep the camera from slipping the grasp of my sweaty hands. The high socks are an ongoing fashion faux pas that started in the 60s and never really stopped. This entry was posted in WXIA on July 9, 2012 by live apt fire.